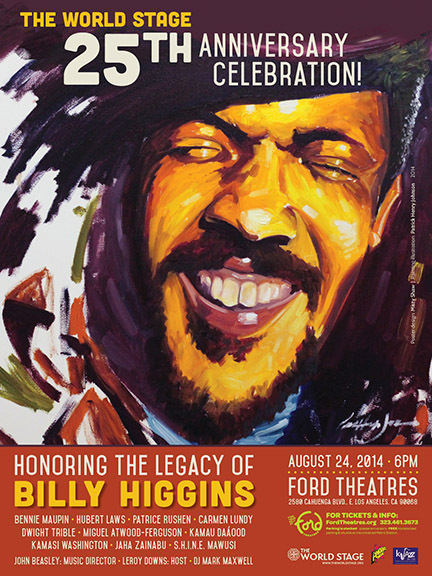 The World Stage returns to the Ford Theatres to recognize local jazz legend and L.A. native Billy Higgins. His profound contribution to the Los Angeles jazz community lives on in the work of the musicians he instructed and inspired. Performances by former students and jazz notables will honor Higgins’ prolific career. Bennie Maupin, Hubert Laws, Patrice Rushen, Carmen Lundy, Dwight Trible, Miguel Atwood-Ferguson, Kamau Daáood, Kamasi Washington, Jaha Zainabu, S.H.I.N.E. Mawusi Women’s African Drum Circle. Happens This weekend ! don’t miss it!